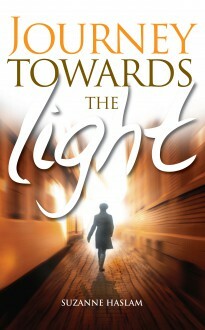 Journey Towards the Light, tells of how Suzanne Haslam’s life changed after she married a man who turned out to be an obsessive control freak, she found herself constantly humiliated, manipulated and bullied. Her husband was clever enough to make sure her family and friends never saw what was going on, and because the abuse was not physical there were no scars, which she could display as evidence. Her family accused her of imagining it all and even allowed her husband – who was working in the family business – to worm his way into their favour as the one who had been wronged. After seven years of misery, Suzanne managed to pluck up the courage to divorce her husband. However, the stress of coping with the abuse and the tension with her family drove her to a full-scale nervous breakdown and she was forced to take extended sick leave from the nursing job she loved. She sought sanctuary in a remote Spanish monastery, where she experienced a series of vivid psychic events, which ultimately showed her how she could rebuild her life.